CBS's Katie Couric declared that “the uproar is growing tonight over the firing of eight federal prosecutors by the Justice Department” and fill-in NBC anchor Campbell Brown teased: “The Attorney General and the firestorm tonight over the controversial dismissal of several federal prosecutors. Was it political punishment?” Brown soon asserted that “it's a story that has been brewing for weeks and it exploded today” -- an explosion fueled by the news media. ABC's World News, the CBS Evening News and the NBC Nightly News on March 13 led with and ran multiple stories on the controversy, which were clearly propelled, in part, by attacks by Senate Democrats who demanded the resignation of Attorney General Alberto Gonzales. But Justice Department clumsiness, which provided hooks for those Democratic attacks, does not absolve the news media of the responsibility for putting the replacement of U.S. attorneys into greater context for viewers so they would understand how Bush's predecessor removed every one (actually all but one as Brit Hume explained) so that Clinton, as is being charged in the current case, could replace them with attorneys more favorable to the administration's agenda. 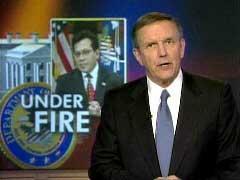 Unlike ABC, CBS and NBC watchers, cable viewers got a hint of context as Steve Centanni, on FNC's Special Report with Brit Hume, pointed out how “the White House acknowledged there were talks in 2005, just after the President won his second term, about terminating all 93 U.S. attorneys just as President Clinton unceremoniously did 1993 after he won the White House.” The point made it onto CNN's The Situation Room -- barely -- thanks to guest Terry Jeffries who raised it during the 4pm EDT hour of the program. Following Axelrod, CBS went to a second full story from Bob Orr on how a former U.S. attorney charged that Gonzales “has let politics infect the justice system” and then Couric conducted a brief Q and A with Axelrod and Orr over whether Gonzales will be fired. Couric also noted how Axelrod's younger brother worked for one of the fired prosecutors.